Reminder: TONIGHT! Evening of Comedy in Baltimore! 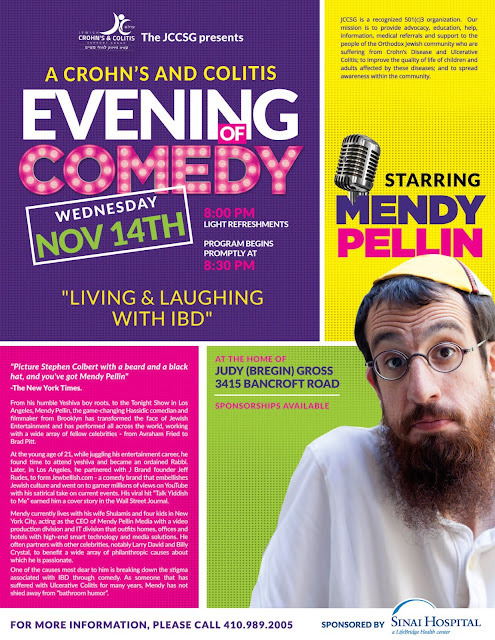 Reminding you about TONIGHT's "Baltimore Evening of Comedy" Starring famous Comedian and Actor, Mendy Pellin! Wednesday, November 14, 2018, at 8:00 pm, at the home of Judy (Bregin) Gross, 3415 Bancroft Rd, Baltimore, MD 21215. Feel free to contact us with any questions or suggestions at Baltimore@JCCSG.org, or call us at 410-989-2005.